In the bond markets of the two countries, a clear divergence is occurring. 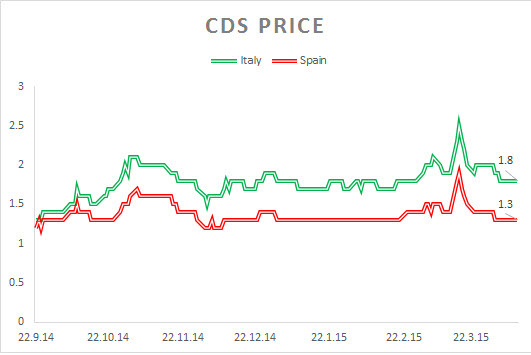 Credit Default Swaps for Spain and Italy, which had moved in tandem in the past (with higher risk premiums for Spain), started to diverge back in 2014. Credit Default Swaps for Italy are now much higher. Those differences are striking, especially given the fact that both economies moved in tandem. The reason for this sudden contrast between Italy and Spain is simply time. Spain’s credit crisis is now behind it and Italy’s looms. In 2012, Spain was in deep trouble; its banking sector was filled with toxic debt. Bankruptcies were surging and investors feared a Spanish debt default. But what followed was a €41 billion in rescue for the Spanish banking sector. Banks were also forced to erase toxic debt and recapitalize their balance sheets. Meanwhile, in Italy, banks are reported to hold distressed loans estimated at €360 billion, with €200 billion which CNBC reports as insolvent. But Italian banks have yet to write off those problematic loans because if they do, just like Spain, they will require a bailout. Simply stated, the difference between Spain and Italy is that Spain has already received a rescue for its banking sector. Once Italy gets a bailout plan for its bruised banking sector, then Italy can stabilize and return to moving in tandem with its peer, Spain. So far, the Italian Prime Minister, Mr. Matteo Renzi, has set in place a meager amount of €5 Billion in a sovereign rescue fund called Atlas. But Renzi also signaled his willingness for a rescue of roughly €45 billion, to be funded by the Italian taxpayer. But that won’t go down so easily. The EU’s new rules forbid a rescue to the banking sector without imposing losses on investors first. The problem is that most investors are just common Italians holding bank stocks and bonds, not institutional investors. Therefore, such an option does not exist for Renzi. Meanwhile, CNBC reports that Renzi’s peers in the EU have been unwilling to bend on that issue. And then of there is also the size of the rescue. With Italian banks holding €200 billion of practically defaulted loans, the rescue must be bigger to accommodate the fallout. As we mentioned above, in 2012 Spanish banks had received roughly the same amount, but Spanish banks had to write down a much smaller amount of €80 Billion. Accordingly, Italy’s rescue must be much bigger. Although this crisis will likely be solved and the EU will probably bend the rules, the solution won’t come quickly. And if we learned anything from the Spanish crisis it is that things are going to get worse for Italy before they get better. And that means we can expect some pain coming from Italy going into the fall months, and the Euro will not be immune to the fallout.